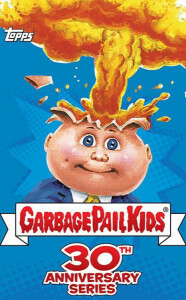 Topps worked hard this year to get as many GPK products on the market as they can to help celebrate the 30th anniversary. 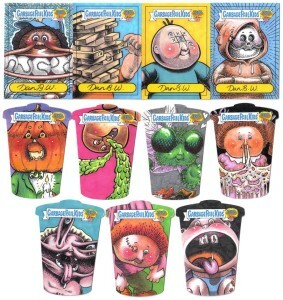 The last of these officially licensed products are Halloween masks made by Trick or Treat Studios. 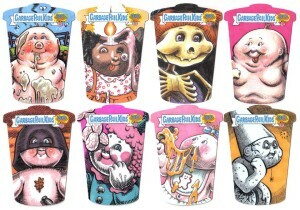 The company is offering 4 masks and 1 decoration in their GPK line. Ranging in price from $60-$80 these masks will allow you to be the only kid on your block dressed as a Garbage Pail Kid! 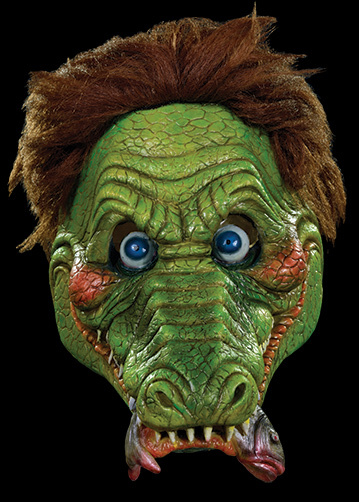 They are offering Ali Gator, Bony Tony, Creepy Carol, and Zeke Freak as masks, and a Glowing Amber decoration for $50. 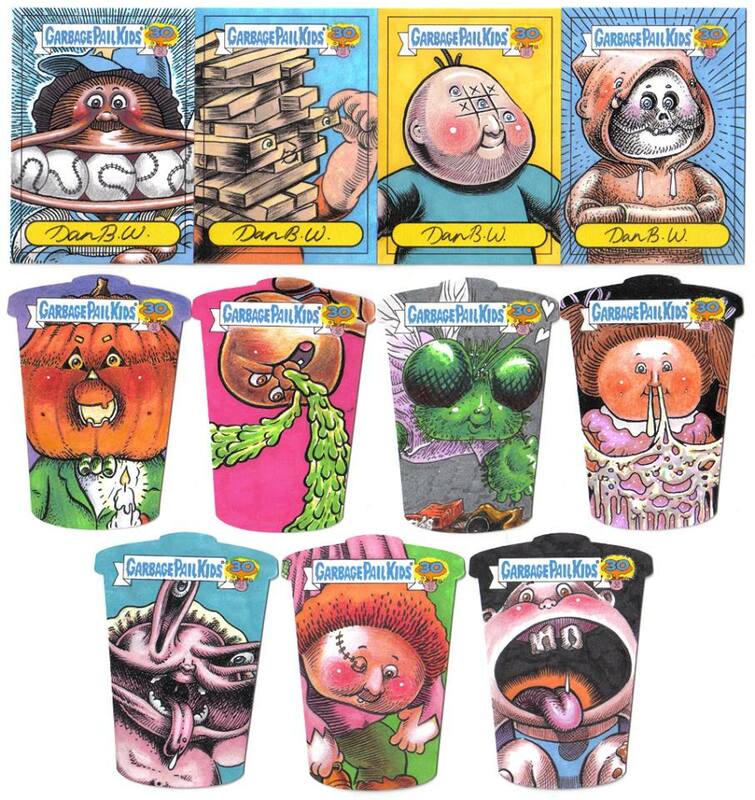 Check out the links below to get your GPK on for Halloween this year! About a month after each new release Topps has been distributing special packs to the discount chain Dollar Tree, and the 30th set is no exception. 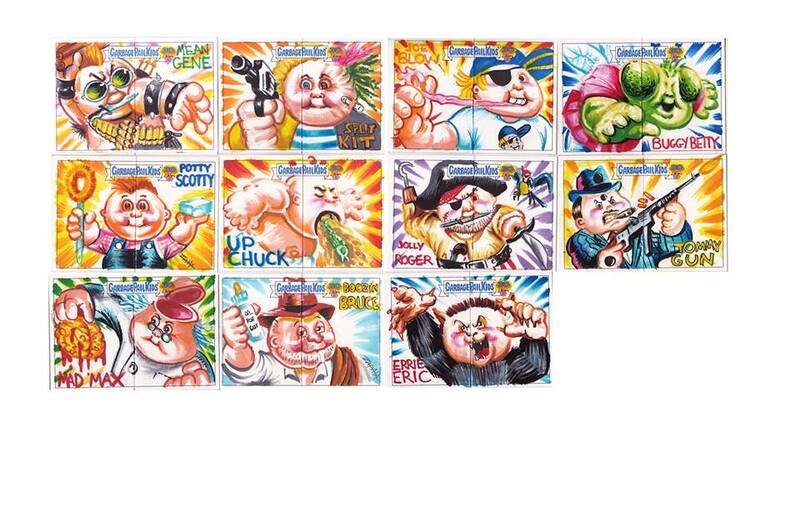 GPK collector Rex Adams was the first to post pictures of these 4 cards packs found exclusive in Dollar Tree stores. Now don’t head out looking to find any printing plates, sketches, or even inserts for that matter. These packs only contain base cards. If you only want to put together the base set, and have fun opening packs, then these are for you! Pack/Box collectors will also be after this version to complete their sets. 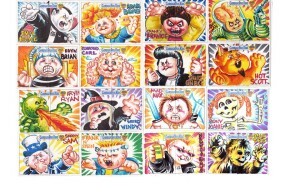 GPK Artist Steve Potter recently posted a YouTube video showing off some of the sketches he’s worked on for the upcoming Garbage Pail Kids 30th Anniversary Set. To see more about the GPK artists visit the Bio and Gallery section over at 80s Playground. 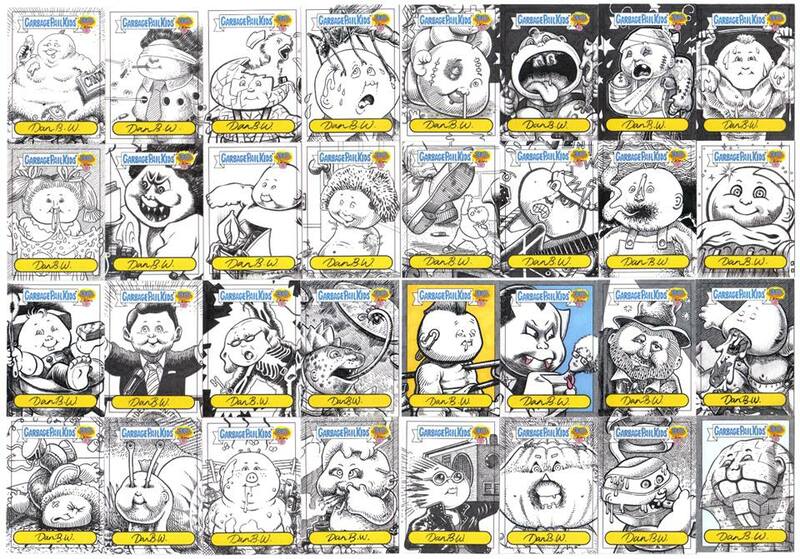 Artists have started posting some of their sketch card work they are doing for the 30th Set. Jeff Zapata posted these to his Facebook page recently. Here are some of my 30th Aniversary Cards. 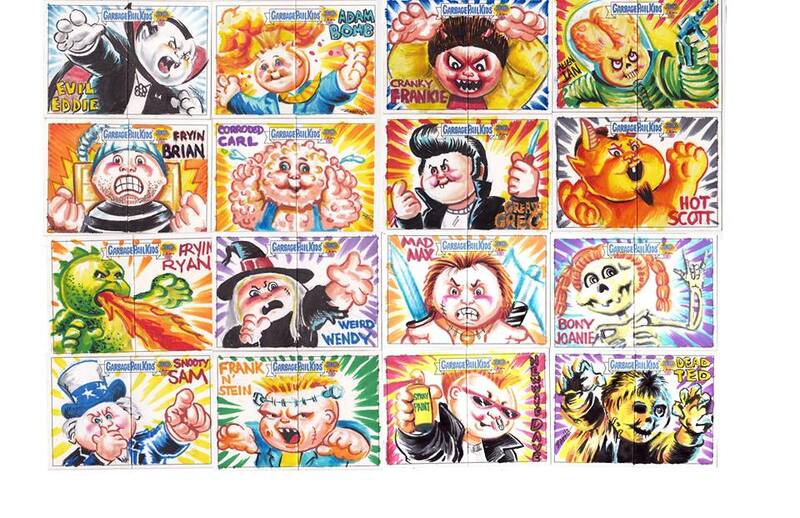 This may be my last GPK sketch cards ( at least for awhile). Hope they are enjoyed. 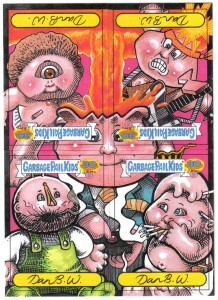 Here’s the last of my Garbage Pail Kids 30th Aniversary fold outs. 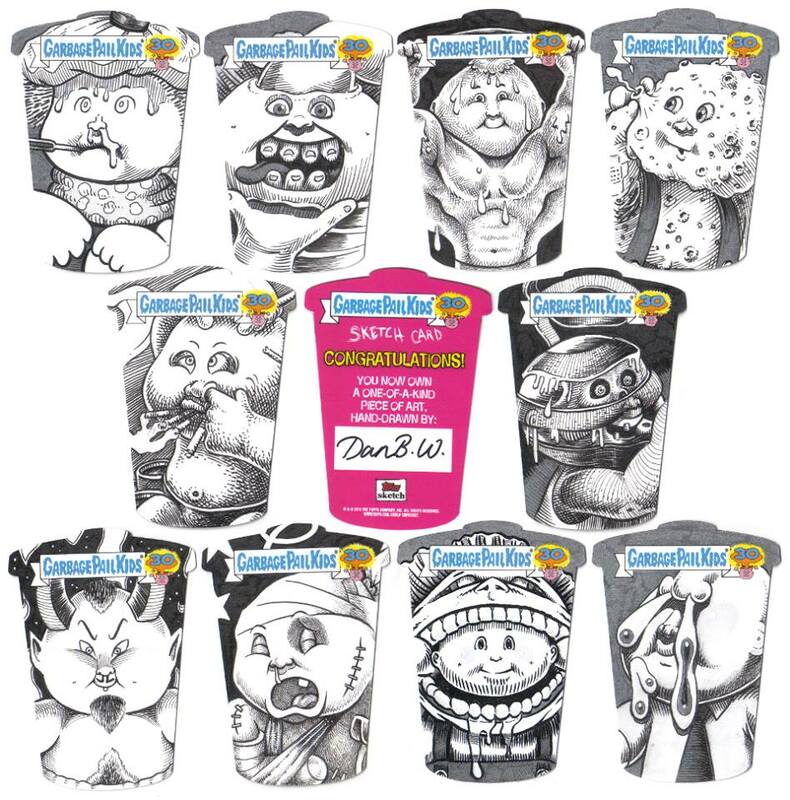 New GPK artist Dan Webster posted some of the sketches he’s worked on for the upcoming Garbage Pail Kids 30th set.. Puzzle Sketches!!! First puzzle card. Very pleased with this one. 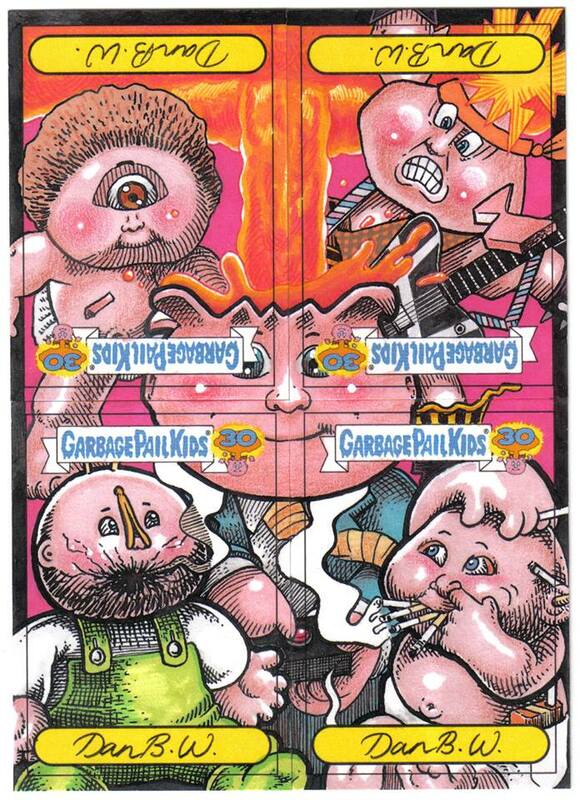 This year Topps is celebrating the 30th anniversary of producing Garbage Pail Kids. They’ve decided to go big for the special set due to be released 7/8/15. The base set will contain 220 cards! As usual there will be “a” and “b” varieties of each card available making 110 different paintings. 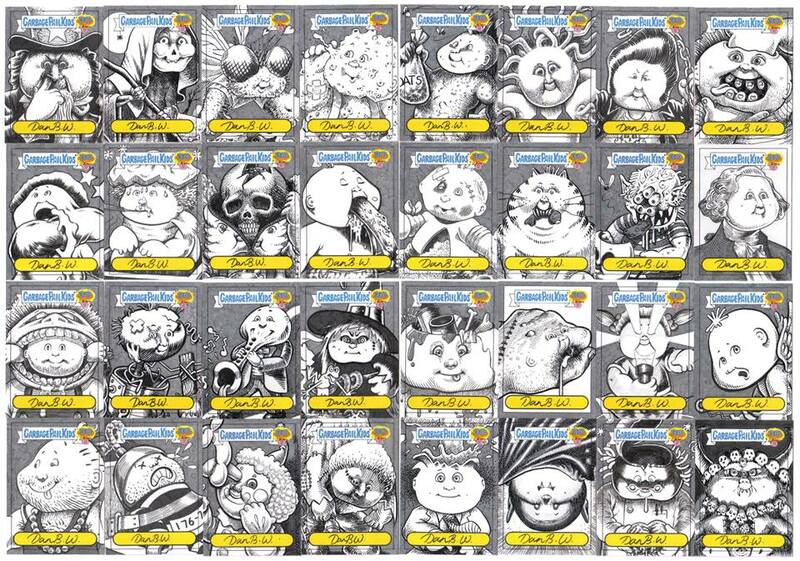 The larger set size allows Topps to have multiple themes this time around. In 2015 Series 1 Topps used a baseball theme. This time there will be 11 different subsets that make up the base set. Categories such as Comic Book Covers, Cutting Room Floor, Garbage Pail Pets, and Garbage Pail Presidents highlight a few of these themes. Of course a GPK set doesn’t stop at just the base set. 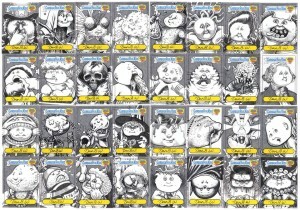 Topps will include three insert sets; Movie Scenes, Horror Film, and Super Fan Tattoo Stickers. 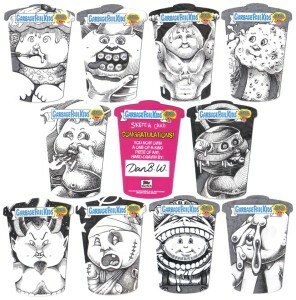 Other popular inserts return for this set including “C” card short prints, Artist Autos, Sketches, and Printing Plates. New inserts for this set include Foreign Legion Stickers. 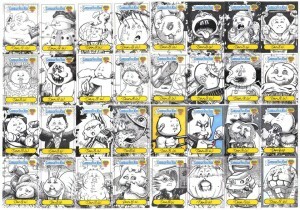 These will be cards done in other languages and inserted only in Hobby packs. These look to be replacing Bonus Cards in boxes this year. Also new are GPK Buyback cards, and Barf Bag Box Loaders….yes Barf Bags. Base card parallels also return in Black, Silver (Hobby only), Gold, Metallic Red (Collector), Character Back (Collector), Sepia (Collector), and Pink (Collector). This time around the Character backs will come one per pack in Collector’s Boxes, while the Pinks will be one per Collector’s Box. One interesting note for this series is how Topps is changing the Collector’s Boxes. In previous series Topps guaranteed a hit in each box. The sell sheet makes no mention of this for the 30th set. 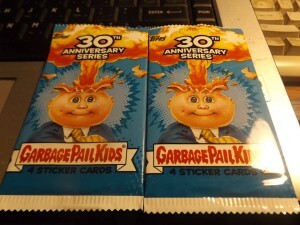 The only guarantees are the Collector’s Box parallels/inserts and a Barf Bag Box Loader. However, Topps is offering quite the number of hits that will only be found in Collector’s boxes such as Artist Relics, Medallion Cards, Stamp Relics, Auto Pen Relics, and Duel/Triple Auto cards. Will be interesting to see how often these fall in packs. Click here to see the Sell Sheet for Topps 30th Anniversary Set.